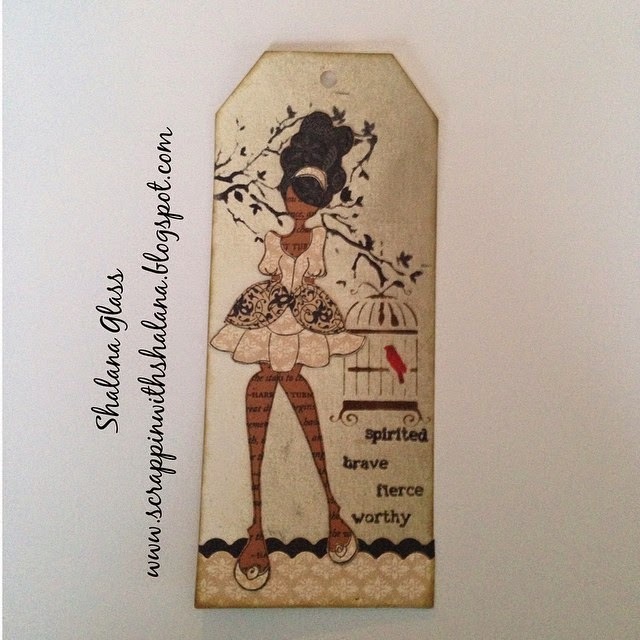 I enjoy stamping with the Julie Nutting Prima Doll stamps! Pairing it with CTMH paper makes it even better!! This is the "Mindy" stamp. I used CTMH Yuletide Carol for her dress, shoes, headband and scalloped paper on the bottom of the tag. The base of the doll is CTMH Saddle card stock. I stamped a Harriet Tubman quote using the retired CTMH Scrapbook Poets stamp set on the base. Her hair is CTMH Snowhaven paper. I stenciled the background using a stencil from TheCraftersWorkshop and the sentiments are Dina Wakley Media clear stamps. I used CTMH ink black, chocolate and desert sand. The bird was colored using the Shinhan Twin Touch markers offered at CTMH. I hope you enjoyed this project. Thanks for stopping by, HAPPY CRAFTING....SHOP WITH ME--> HERE.